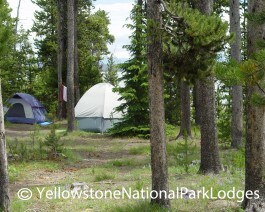 Located on the southwest shore of Yellowstone Lake, the Grant Village Campground is situated at an elevation of approximately 7,800 feet in a lodgepole pine forest, just a few miles from the West Thumb Geyser Basin. The campground offers a relaxing setting with easy access to many services and amenities. Grant Village Campground is just over 40 miles from Colter Bay. There are over 400 sites at the Campground, including tent, RV and combination tent/RV sites. There are also 8 group campsites. Campsites for hikers and cyclists are also available. Each site includes a picnic table and fire grate. Water is accessible near the campsites. Grant Village Campground has 17 public restrooms with flush toilets and cold running water.